Anime has been around for just about 100 years in one form or another. Popular in Japan for most of that time, the animated creations seemed to explode on the world scene in the 1970’s and 80’s. Moving forward into the 21st century “Girls und Panzer” or Girls and Panzers was created by Actus Co., Ltd., which was a take-off of a manga “flapper magazine” (comic book) from earlier that year. There is a spin-off movie in the planning for some time in 2014. The main story behind “Girls and Panzers” centers on a young student named Miho Nishizumi. In a universe where school girls take part in a form of marital arts training known as Sensha-dō (the art of operating tanks), young Miho leaves the world of Sensha-dō and enrolls in Ōarai Prefectural Girls High School. The art has been banned for many years, only to have Sensha-dō reinstated, and with her past experience she is ordered to take part. Soon, Miho begins to enjoy it. Since the school has abolished the training, there is nothing in the way of armor to choose from, other than a mishmash of tanks from around the world making up the seven teams from Ōarai Prefectural Girls High School. The Anteater Team is what this kit is based on. The tank used by the team is the Type 3 Chi-Nu. The crew is made up of three students: Nekota, who is the team's commander and radio operator; Momogā who is the driver; and Piyotan, who is the gunner and loader. The Type 3 Chi-Nu is a medium-sized Japanese tank created to counter the American's M4 Sherman. Early on, it was found inadequate to the Sherman and some modifications were made. This tank was to be used for more or less Japanese homeland defenses. There were 144 Type 3 made late in the war until war's end. Despite six regiments being equipped with the Type 3, none of tanks ever saw combat before the end of the war. The Type 3 was comprised of the hull and running gear of the Type 97 Chi-Ha tank. The primary armament was a 75mm Type 3 tank gun, which was the largest gun mounted to any Japanese tank during WWII. There remains only one surviving Type 3 Chi-Nu medium tank, which is on display at the Japan Ground Self-Defense Force Military Ordnance Training School in Japan. 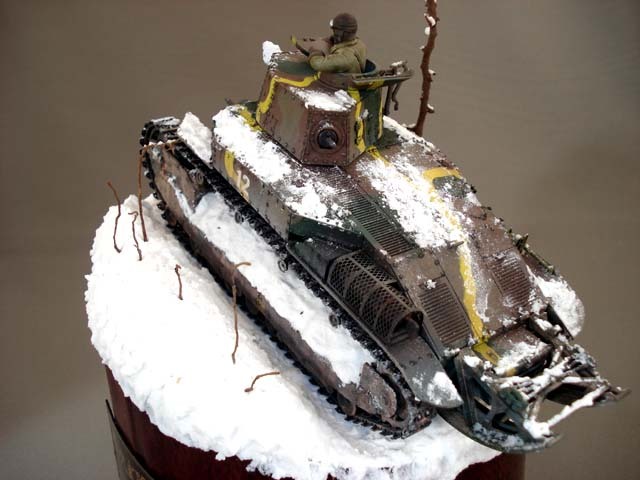 This kit follows two previous releases of the same tank from Fine Molds. The first being in 1998, with more parts added to the second in 2009, including adding the modified long barrel. This kit is basically a re-release of the first kit with changes in the decals to support the Anime series it was based on. Being from Fine Molds and the same kit previously released from them, this kit sports a very clean, crisp mold with many raised and recessed details on the lower and upper hull parts. The fit between the upper and lower hulls is excellent, as you would expect from Fine Molds. There is little to no flash on any of the remaining parts. There are no big surprises with any of the pieces. The road wheels, for example, have the standard seam line running around the outside of the rubber tire portion of the parts, and there are two ejector pin marks on the inside of each which you can choose to fill or not, as they will not be seen in most cases. The suspension parts are very well-molded and should have little clean-up once removed from the trees. The turret is spotless, and comes with the option of the “open hatch” approach; however, there is no interior detail offered with this kit, so detailing up will have to be done via scratch-building the interior parts if so desired. The vinyl tracks are fairly straight-forward as these are molded in black vinyl and attached to vinyl trees to prevent over-warping. No defects to the tracks were noticed, and they should be able to be painted and installed with little to no trouble at all. The decals supplied with this kit are printed very well. Albeit not the standard Type 3 Japanese markings, they appear as good quality and will enhance the anime version of this tank nicely. The eight page instruction sheet is printed in black and white fan-fold style. Printed predominantly in Japanese, the individual steps have both English as well as Japanese labeling. Each step is in a standard semi-exploded format and is easy to follow. The last two pages of the instructions give the painting and decal layout for the tank in two versions, both centered on the Anime Series. This is an exceptional kit, especially if you are in to Japanese armor, and of course if you are a fan of Anime or the series "Girls and Panzers." The kit does seem priced a little high for basically the same kit as its predecessor with a new set of decals and only the Anime options. There are several online stores that offer the kit for less than the suggested retail price. This could be driven by the popularity of the animated series which it depicts. The tooling is very nice on this previously issued kit, and should build up to a nice-looking version of the tank. 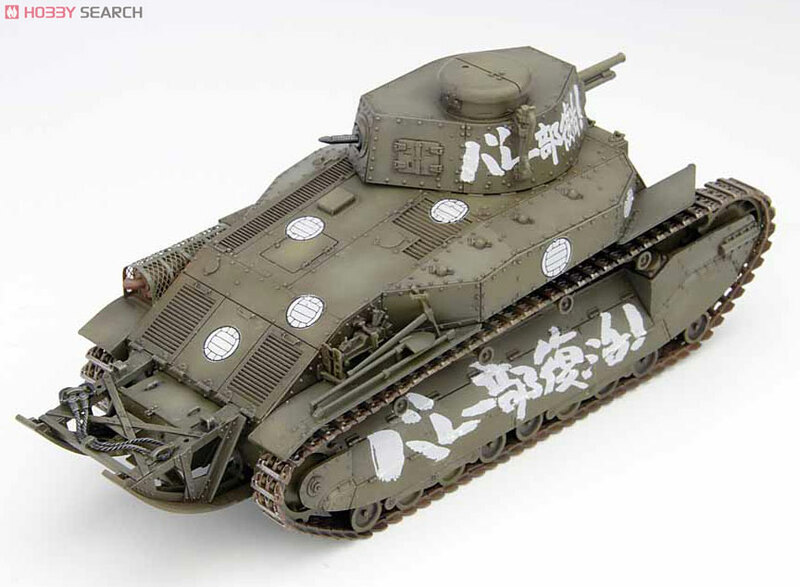 Personally if you are not at all interested in the world of Anime then you may want to look into one of the two previous versions of the tank where the correct markings will be included in the kit. Otherwise, this is an all-around fun-looking kit and is sure to please the "Girls and Panzer" enthusiast. It would have been a nice touch for Fine Molds to add the three supporting crew members to the kit to complete the entire motif of the build. Maybe it will be considered on subsequent releases. Highs: What we have come to expect from Fine Molds for quality with a well molded kit with a lot of nice details with easy to follow instructions. Fun subject, perfect for the genre it is meant to portray. Lows: The suggested retail price is a bit high for what you are getting from a value sense with only the Anime Series decal options and no photo etching. Verdict: I feel this is a beautiful kit for the genre it is intended for. Excellent molds are sure to please as will the colorful decals that accompany it! The price could be a lot lower to gain more followers. wonder why this doesnt come with paper dolls and a flower pot for the turret bin? Thanks for checking out the review guys! Like I mentioned pretty much the former Type 3 Chi-Nu from Fine Molds which is a decent kit. The Anime factor is certainly not for everyone....lol, myself included for the most part but with all seriousness this stuff is absolutely HUGE worldwide...Multi-billion dollar powerhouse and growing. Usually this stuff fits into it's own niche with Sci-Fi like Star Blazers and Gundam or figures, this just happens to be the crossover to our modelling world. This may not get much eye raising amongst our modelling brothers in arms but its out there and there is a large following and worthy of its promotion. The interesting thing about this particular team of girls is that they're made up of online computer game fans: they all but say World of Tanks. I'm an anime and Japanese equipment fan, but this show even pushes my tolerances... lol WW2 tanks generally didn't accelerate and corner like sports cars, but they sure do in this show! A Tiger I spins its turret at speeds that would embarrass modern tanks. A Maus(!) drives up on a Hetzer monster truck style. It sounds silly, but I've run into people who think this show is completely factual-- that's pretty scary. lol Having pretty much all of Fine Molds' IJA line in their original release versions, I don't really need to get the GUP versions. But if it gets some IJA armor into some new hands, that's a good thing. Incidentally, when I bought my Type 89 a couple years ago, it was a package deal as the kit was split into thirds to coincide with the release of three issues of Model Graphix's Armour Modelling magazine (120 pages each, lots of great photos, I have no problem with the Japanese text). *At the time* it was $50 delivered (now it would be closer to $80). Was it worth the extra $5 to get a total of 360 pages of modeling goodness in place of the GUP sheet of anime girl decals? Absolutely. Nice bid there Kurt!! Save some change and ended up with a nice kit too...nothing wrong with that!!! In retrospect, $45 for a kit and a couple bucks for decals building one of these OOB most are under the pile of cash shelled out for some other kits with less quality!!! I bet you won't post any pics of it in your stash though Kurt. I got all of the accompanying stuff to go with the tank when it first came out in the magazine edition (again, for far less than now) so yes, I have the tracks, PE, and barrel (the latter two were both included in the original detail up set). The differences between the two versions, Kou and Otsu, (mantlet, body tweaks, vents on rear) don't matter when it comes to the PE because the PE is only a muffler cover and license frame-- and those parts are exactly the same on both versions. Check out AJ Press' Japanese Armor 1931-1945 to see what I mean. Here's the GUP Kou: Here's the Otsu (note no difference in PE): Besides, the PE no longer being available isn't really a major issue-- it's not like we're talking about a full-on Eduard set here. If you can't get the PE, a generic mesh piece will pretty much do the job of muffler covering with some styrene strips for the bands. In fact, plenty of Type 89s were in the field with no muffler cover at all (only the bands), so it's even less of an issue. The key thing about having the magazines is the content. Full build/ detailing article on the kit. An in-depth walk around of a restored example with lots of great detail shots, including a reenactor with accurate IJA tanker uniform. Even at the price you're quoting, I think it's more than worth the additional $39 for the accurate historic decals, extra research material included, as well as other great articles. Definitely more so than a decal sheet with anime girls that won't even be used if building a historic example and an easily replaced PE part. Again, your mileage may vary. BTW, Kurt, will you be attending the PennConn in September at Carlisle? I'll be there if you want to meet up and I'd be happy to bring the mags along to show you.